I hear Catie call out above me: “I’m sooo sick!” I break out of the heavy trance of icy steps I’ve been following and look up.She’s is grinning from ear to ear as she plunges her ice axe into the crusty layer of snow above her, kicking her leg up into the “A” position not unlike Jim Whittaker’s famous pose when he first stood atop Mount Everest. We’re kicking steps up the steep north ridge to the top of Mount Tukuhnikivatz, the third tallest peak in the La Sal Mountain Range in Utah. At 12,482 feet, Tuk looms 8,000 feet above the unforgiving sea of Moab’s desert, a lofty ceiling atop a mess of red rock. I look up at her and Sophie, then across the mountain to our friends climbing from the other side—I can’t help but smile. Cruising to the top of a mountain with 11 of my best girlfriends and not another soul in sight overflows my heart with gratitude. I kick a few steps of my own to catch up and carve out a seat in the snow to wait for our group. Perched on our icy lookout, I push the brim of my hat out of my eyes and let the vastness of our surroundings wash over me. The hazy desert below us feels like a distant memory, but it wasn’t even 48 hours ago that we were mellowing around a dusty campfire and riding bikes over slickrock. If I squint my eyes I’m pretty sure I can spot the trail we rode from camp. Any skier who’s driven south on 191 into Moab to bike, hike or climb can surely relate to the unyielding allure of the La Sals in the distance. Getting dirty in the Moab desert almost always incorporates an element of multi-sporting, a serious undertaking for adrenaline junkies no matter your preferred mode of travel. Adding skiing to the list is the next logical step. The La Sals are the second highest range in Utah, and run right along the Colorado-Utah border. 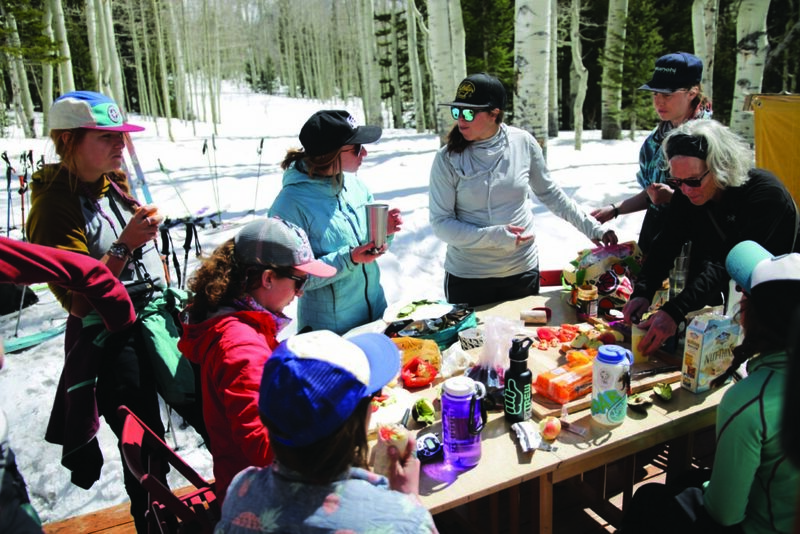 Although they’re a reasonable weekend drive from Salt Lake City or the Front Range, the La Sals see a fraction of the traffic of the Wasatch or Summit County. These peaks are as pristine as you can get these days without schlepping out to a remote heli-accessed glacier in Alaska. Sophie made reservations for mid-April at the Gold Basin Yurt in the La Sals and spread the word to our friends. Considering Utah’s dismal snowpack, it was a risky move, but excitement to ski in the desert burst any negative bubbles before they formed. Of course, six people quickly turned to eight, which inevitably turned to 10 and then a cozy 12 by the time spring rolled around. Our plan was to gather in Moab on Friday night—friends would trickle in from Jackson, Aspen, Boulder and Fort Collins—drive up to the Geyser Pass Trailhead on Saturday, skin into the hut for two nights, and pack out on Monday. We would have a full day of skiing from the hut on Sunday and agreed that if conditions lined up, Mount Tukuhnikivatz would be a reasonable goal. Laura, Catie, Lucy, Molly and I arrived early on Thursday to stake out a camp spot and take advantage of the balmy springtime weather in Moab. Laura and I peeled off with our bikes, while Catie, Lucy and Molly went to climb on Potash Road. The waning sun cast a warm, fiery glow as we whooped and hollered along the trail. I scrambled to get my bike legs under me again as we glazed over slickrock, giving in to the familiar (and slightly terrifying) euphoria of flying across the earth on two wheels. “It doesn’t look like there’s a whole lot of snow up there,” said Laura, pausing at the top of a hill to glance across the valley. She wasn’t wrong—although a dark, evening shadow blanketed most of what we could see, there was no denying that snow up there would be scarce. “I’m sure it’s hiding up there somewhere,” I said, doing a terrible job at masking my skepticism. We agreed there was no use dwelling on it—we’d find out soon enough—and pedaled back to camp, still bubbling with excitement from our ride. Not one to give up so easily, my sometimes cruel, overactive imagination kicked into overdrive. What if we’re hiking in the mud? What if there’s no snow at all? What if I’ve somehow offended the Snow Gods and I’ll never ski again? Should I move to Hawaii? Although my mind was racing in (delusional) circles, we reached our campsite a few minutes later and were met with a rush of hugs and laughter from old friends. The negative thoughts swirling through my head released their grip in an instant, giving way to the childlike effervescence for adventure that I knew all too well. Whatever happens, it sure as hell won’t be boring. After a violently windy night, we were all eager to rid ourselves of the thick layer of red sand that caked our tents, sleeping bags, coffee mugs…and somehow the inside of my mouth. We packed up as efficiently as if there were a tornado approaching and caravanned into town to organize and distribute gear. The dirt road up to Geyser Pass abruptly rose from the valley floor, and 45 minutes later we pulled up to the trailhead, miraculously still hanging on to a skiable amount of snow. The skin into the Gold Basin Yurt took about 30 minutes—a ridiculous yet marvelously short approach—and an hour after we parked the car, we were indulging in a hard-earned spread of charcuterie and wine on the porch of our new home. Mount Tukuhnikivatz barely poked through the smattering of aspen trees that surrounded the yurt, and we decided to take an evening tour to do some scouting. While most of us had our objective in mind, there certainly was no shortage of lines to ski from here. 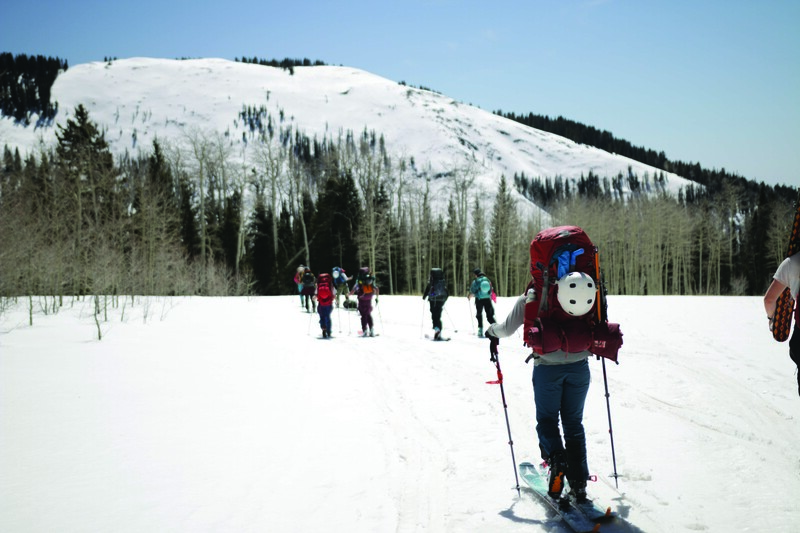 A quick skin from the yurt drops skiers in a valley flanked by big mountain giants. Mount Peale (12,721 feet) and Mount Mellenthin (12,645 feet) rub shoulders with Tukuhnikivatz, boasting west-facing lines that each looked steeper and faster than the last. We held a team meeting during dinner and talked through our options between bites of spicy Thai curry and chocolate chip cookies. The conditions we’d seen that afternoon were steep and firm. Due to the nature of the north-facing slope we had our sights on, the snow likely wouldn’t soften up much. We agreed that both routes to the summit would require comfort with exposure as well as crampons and an ice axe. Although quite a few members of our group had never used crampons or an ice axe before, everyone was keen to learn and excited to push themselves a little as long as it felt safe. We agreed on a few decision points, spots where we could split up into smaller groups, and decided to leave the yurt at 7 a.m.
As we drifted off into sleep, Laura shared some wise words with us that have stuck with me ever since: The only emotion that overpowers fear is gratitude. We followed the same familiar route up Gold Basin. The soft swooshing of skins gliding along the frozen creekbed lulled me into a comfortable pace as I let the first rays of sunlight embrace me in a warm, fuzzy hug. About an hour later we broke through treeline, approaching our decision point on the valley floor. We split up into two parties—I rallied a group to climb the north ridge and Laura led a group up to the east saddle. If everything went according to plan, our routes would meet at the summit. We high fived, passed around chocolate-covered espresso beans, and agreed on a few inappropriate radio names before parting ways. Halfway up the ridge, Sophie, Catie, and I sit on our makeshift ice bench. “This is probably the most awesome I’ve ever felt about myself,” Catie jokes. Two-hundred vertical feet later, we reunite with the rest of our friends on the summit, giddy with appreciation for each other and the breathtaking scenery surrounding us. Catie has a point. In the mountains, we’re taught to check our egos—for good reason—and remember that we are always at the mercy of the mountain. We are miniscule and powerless in comparison to our surroundings. But climbing a mountain with skis on your back is hard. And gathering a dozen women in their 20s to join you is definitely not the norm. Part of why we climb mountains is to prove to ourselves what we are capable of and we shouldn’t shy away from celebrating that. Catie is one of the most humble people I know, but when you climb a mountain with crampons, an ice axe, and your skis strapped to your backpack for the first time, you should give yourself a pat on the back. When we dropped in from the summit, conditions had turned more favorable than we’d anticipated. Soft, creamy turns through perfect spring corn wound us down the ridge towards the saddle that Laura’s group had ascended. We skied one at a time, taking turns whooping and hollering with joy as we flew towards our friends below. After regrouping at the saddle, our north-facing line still clung to the hard shell of last night’s freeze. With Laura in the lead, we carefully bunny-hopped down the steep face, firm but edge-able, relaxing into wide, sweeping turns as we approached the bottom. Yes, we are awesome. While it sounds a little ridiculous to say it—no shout it—out loud, Catie’s hilarious new mantra became a great reminder of how important it is to take pride in your accomplishments and the people that you get to share such a beautiful life with. 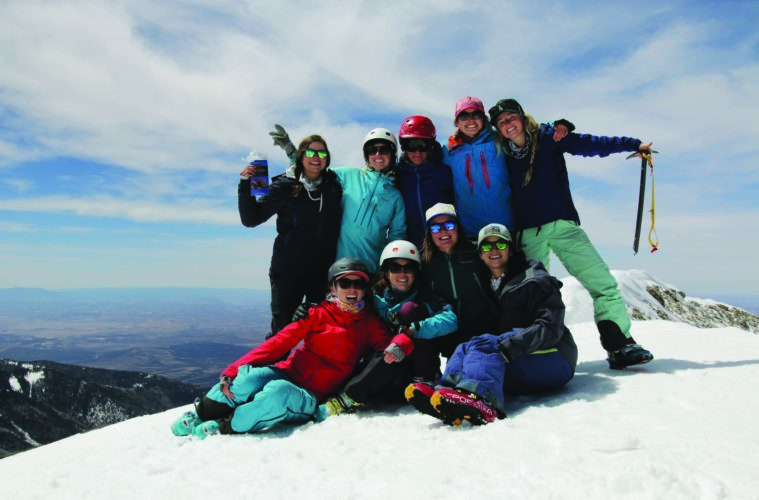 After all, how many times in your life do you get to stand on a huge, snowy summit, floating above a panorama of red desert, surrounded by 11 ripping ladies? And how else would you end such an extraordinary day than with a naked lap down to the valley floor? Joys of the Lone Wolf The December Issue is LIVE! The Ultimate Rocky Mountain Top 25 Numerology: Meet the Jones The October Issue is LIVE!